Ideas rigs with some available for convenience if you need them. With quality Swivel and American Snap Link. 1/0 hooks enable easy unhooking, size 6 better for the small bait fish. A great value rig. 7' long quality trace, two 2/0 hooks, for Plaice over over Mussels beds. Species - Plaice, and whatever likes your cocktail bait. 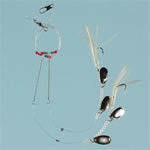 Lightweight multi species rig, for bouncingback in light tide flow for small species of anything. Just vary the bait or cocktail on each hook to attract a different species. Better during small tides. A small hook can still catch big fish. Another light weight multi species rig and will catch all sorts by simply varying the baits. Better during small tides and over slack water, when the fish come up off the bottom. A small hook will catch big fish. 5' Long trace 3 off size 2 Black Aberdeen Hooks to swivel. Another light weight multi species rig and will catch all sorts by simply varying the baits. Better during small tides and over slack water, when the fish come up off the bottom. A small hook will catch big fish. 6' long, 50lb nylon, single 5/0 Black Aberdeen for King Rag worm baits, with lumi bead and quality swivel. Ideal for big Hounds but will catch small smuts too. Species - Hounds at Anchor. The red sharp Aberdeen hooks will catch anything, but better at slack water or when uptiding. Just vary the bait, create a cocktail on each hook to attract a different species. Modified from typical, with quality swivel and American snap link. Improve your chances when they are shy and hard to hook. Modified Fladden rig with orange tube attractor, and quality swivel. 200lb short traces for anchoring in and around rocky marks. The 'weak link' get of jail free clip' allows a stuck lead to break off but you keep your fish. Species - Huss, Skate, Conger, Bass. Lots of Colour and flashy, 75lb trace. 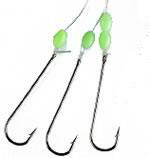 Anchored big tides or work on the drift, these are ideal for Cod, Huss and Spurs. Conger in particular but mid-Oct to end-Feb when they roam open ground in the Wight area, they take these too. With 8/0 Pennel plus single 8/0 on additional snood, 6' of 150lb nylon with lumi beads and lumi muppet. Ideal for bigger species. Allows for two good bait options to be tried at the same time. Species - Blondes, Cod, Congers, Spurs, Tope etc at anchor to avoid the dogs hanging on. With 3/0 + 4/0 Pennel plus single 3/0 on additional snood, 7' of 50lb nylon with lumi beads. Ideal for mid size species general fishing at anchor with tide running. Allows for two good bait options to be tried at the same time. Species - Rays, Hounds, Bass, Congers, Cod, Tope, Spurs etc at Anchor. Two 8/0 Pennell, 6' of 150lb nylon with lumi beads and lumi muppet. Ideal for larger species. Species - Cod, Congers, Spurrs at Anchor. Zip sliders, Breakaway fast links and lumi beads for preparing your leader end on 2 lines ready for action and for quick change speed fishing. 3/0 hooks enable easy unhooking. A great value Hokkai type rig. Species - 6/0 - Same but when fussy for the bigger fish + Cod.